The wife and I decided to venture abit further from the city centre yesterday. So we went to see the showflat for MEADOWS @PIERCE, which is located at the actual site (i.e. former Green Meadows) at Tagore Avenue off Upper Thomson Road. MEADOWS is a 479-units freehold project built on a 460,000 sqft plot. It consists of one 14-storey block and three 5-storey blocks, arranged in an “8” shape along a rectangular piece of land. We understand that there is a “5-storey height restrictions” imposed on the plot. So how did UOL get away with one 14-storey block? It turns out that the tall block was part of the original Green Meadows development. In order to retain this, UOL has to keep the original structure intact and gut out the interior of this 14-storey block to put in new apartments. The expected TOP of MEADOWS is September 2012. The tower block contains all the 1, 1+1 and 3-Bedrooms units, plus four of the penthouses. We were told that you can actually combine a 3-Bedroom with a 1+1 to form a single bigger unit by knocking down a wall. There are also three “Tree House” units located at one of the lower block (Block 628) – these are basically 4-Bedroom units on the second floor, but with an extension out to your own private pavilion (Tree House). • Tree House – this provides an elevated platform for residents to appreciate the greenery around the development and the Pierce Reservoir area. • Dog Running Court – an exercise area for your pets. A total of 499 underground carpark lots will be provided for the 479 units, which are only just about adequate. The sales gallery/showflat was opened since the project launch in April 2009. Two showflat types are available for viewing – the 2659sqft, “4+1” Ground Maisonette (GM) and the 2680sqft 5-Bedroom unit. Both come with 2.85m ceiling, good-sized bedrooms and spacious living/dining areas, “Electrolux” hob/hood/oven (no fridge, washer or dryer) and “Hansgrohe” bathroom fittings. The 5-Bedroom unit has both wet & dry kitchens as well as master and junior suites. The wife and I are particularly impressed with the GM unit. The living/dining/kitchen/yard, master + 2 other bedrooms are all located on the ground floor. A staircase then leads you down to the basement level, where another bedroom, bathroom and a family room reside. A door in the family room opens out to the basement carpark area. Another door in the basement bedroom leads you into a small open courtyard, which provides the basement rooms with natural light. So effectively you have a self-contained living/ bedroom area in the basement that provides added privacy from the rest of the apartment. We liked this apartment layout so much that we have included the floor plan with this post. Too bad we are not really “ground floor lovers” else this will definitely be one in our “wish list”. • Did we mention the GM unit? We like the space in all the living areas – even the kitchen is of good size. 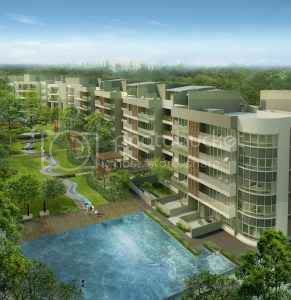 • Price – This ranges from $750 – 900psf for units in the lower blocks and up to $1000psf for units in the Tower block. The 2,659sqft GM unit will cost you $2 million after discount, which equates to $752psf. The price is pretty decent for a freehold apartment these days, even if it is a “suburban” project. • The quality of furnishing provided is rather poor – Homogenous tiles for the living room, unappealing kitchen cabinets and wardrobes that are not “full height” (i.e. gap between the top and ceiling). • There is only ONE primary school within 1-km of MEADOWS – St. Nicholas Girls. So for parents that needs to get their sons into primary school, tough! As of yesterday, 59 out of the 104 units in the Tower block and 310 out of 375 units for the three lower blocks are already sold. For those eyeing the 5-Bedroom units, you be disappointed to know that all have been sold. The three “Tree House” units are also taken, so no luck on that one as well. But 5 of the GM units are still available for those interested. The units in Block 630 are selling the fastest, as this is considered to be the best facing – overlooking the landed houses in Teacher’s Estate. Block 630 is also where all the GM units are found. No Comment to " MEADOWS @PIERCE (Review) "